My friends, is there anything that this world knows less about, or is more mixed up on, than the prophesied World Tomorrow and its connection with the purpose being worked out here below, or even with the matter of salvation itself? Why this Babylon of religious confusion? 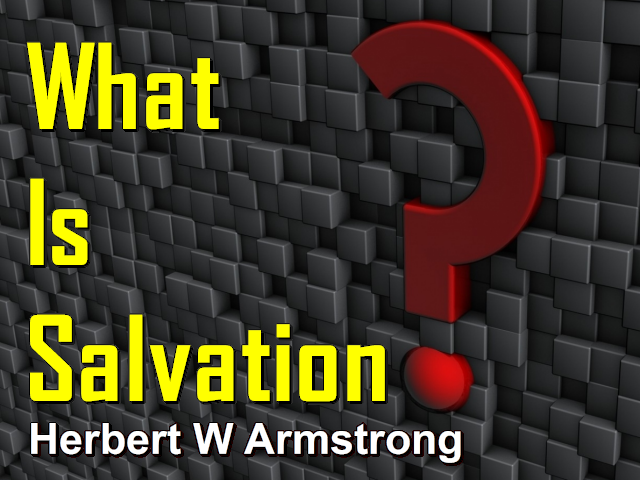 Why do so few, even professing Christians, know what salvation is and how to obtain it? Why does almost every religious person believe the diametric opposite of the basic teaching of Jesus Christ and of the apostle Paul, and the other apostles for that matter? Why do professing Christians practice religious customs that were condemned by Christ and by the apostles and by your Bible, never observed by the church that Jesus did build? The original true church of apostolic days, headed by Jesus Christ — not by any man — but headed by Jesus Christ, who used the apostles as His instruments in building and expanding and conducting His church. Why does the original gospel which Jesus preached, the same gospel that the apostle Paul preached to the Gentiles seem so strange today? Why do people think that sounds strange and fanatical today? Why, the central theme of what people today call fundamental Christianity, is salvation. Then why is it that so many professing Christians don't understand what it is? And don't even understand salvation. Could it be, my friends, because God Almighty in your Bible prophesied, where ever the future of the professing Christian church was mentioned, He foretold in His prophesies: APOSTASY? A falling away from the truth, being turned to fables instead of the truth. Turning away from the truth, turn to these fables; honest, but deceived. Well, this listener had those ideas, not a regular listener I believe, but one who had been drugged by this popular deception. And was rather shocked at hearing the truth on this World Tomorrow program. And so this listener wrote me quite a reproving letter. In fact, this listener condemned me straight to hell. Now I read this letter in the previous program and I didn't get through commenting on it and answering it, so I'm going to continue. "You seem," wrote this listener, "to reject the very central message of the Bible. That apart from the blood atonement of Christ, no one is saved. The one and only way by which man may be saved and put above it," that is above the blood atonement of Christ, "as most important the ten commandments. To you," says this listener, who hadn't listened very many times and apparently didn't know very much about what I preach. "To you the scripture reads, 'God so loved the world that He gave His only begotten Ten Commandments that who so ever keeps them shall not perish, but have the gift of everlasting life.'" Now I'm quite sure that none of you regular listeners — thousands and thousands of you that have been listening for years have ever heard me say anything like that, except in quoting it from this letter. And I did explain thoroughly in the preceding program that there is no way, my friends, to get rid of your sins and to be reconciled to God and to come to the place where you can receive the gift of eternal life, but through the blood of Christ. You know a lot of people have heard a lot of things that caused them to believe that Paul didn't say anything like that. Why they think that Paul said, 'Why the law is terrible. The law was a terrible mistake. God made an awful mistake when He gave the law. The law of God is against us. The law of God is contrary to our best interest. Oh if you keep the law of God, you are lost. You are under a curse if you keep the law of God'. That's what a lot of people seemed to believe. My friends, regardless of which translation you have. Whether you have the Authorized, the King James Version. Whether you have Roman Catholic Bible, whether you have the Moffatt, or the Good Speed, or the Fenton, Ferrar Fenton, or any of the more modern translations, or whether you have the Revised Standard, the American Revised, or what translation you have; you are going to find that right there in your Bible. And it's in the seventh chapter of Romans and in the twelfth verse. It's in your Bible. Why do so many people hate the law? Now here was someone, here was a woman who hates the law of God. Well she had been listening to a lot of popular ideas. She was born into this world, not too long ago, because none of us live very long in this span of the existence of this earth. And so regardless of her age now, it wasn't very long ago when she was born. And the instant she was born she didn't know anything. She had none of these ideas in her head then at all. Not any of these ideas were then in her mind — it has all come since. Where did she get them? Why, she heard other people say those things. It's the popular thing to believe. She did not read any such ideas in the Bible. And she hadn't listened very long, or she wouldn't have accused me of denying the blood atonement of Christ. Because, you have sinned, my friends; every one has sinned. And "...sin is the transgression of the law" (I John 3:4), and "...the wages of sin is death" (Romans 6:23). D-E-A-T-H. That is the penalty of sin. And the law claims your life because you have broken it. And so you are under the law and the law is over you and the law owns you and has a valid claim on your life, because you have broken the law. Now Jesus Christ came and took your sins. He took them on Him and He had never sinned. And He paid the penalty for you in your stead. But, it applies only if and when you repent and turn away from sin, which is the transgressing of God's law (I John 3:4). In other words, turn away from disobedience to God and turn to obedience to God. My friends, that's the one great issue in ALL the universe. And let me tell you, there is a reason why CHRIST HAD TO DIE ON THE CROSS. My friends, you have sinned. And Jesus was nailed up to the cross BECAUSE OF YOUR SINS — DON'T SIN ANYMORE. And it doesn't apply until after you've repented. Well, now let's get along with this. "You think the law was given by God and the observance of it will give to a man a righteous standing before God. That," says this listener, I'm quoting now again from this letter that this woman sent me. "...that is impossible, because God demands absolute perfection and obedience and man cannot give such obedience. Man has proved himself incapable of being righteous." Well, I read to you in the first chapter of Luke where the parents of John the Baptist were both found righteous. And where they kept the commandments of God perfectly, and that was before the Holy Spirit was given. It was before they could have really had the Holy Spirit at all, but it does say here that they were both righteous before God. Now that's in your Bible. So apparently this woman who wrote this had never read her Bible very much. But I explained in the preceding program, my friends, that love is the fulfilling of God's law. And it isn't any love you were born with — it is "...the love of God shed abroad in your heart by the Holy Spirit (Romans 5:5). And when you have the spirit of God, that spirit of God is active. It is flowing, it is dynamic, it is not static. It is moving and it flows into you from God. And we love God because He first loved us. And He showers His love upon us and into us through the Holy Spirit; and His love wells up out of us back to God in reverence and obedience, adoration, and out to our neighbors in love and charity and patience, kindness, and goodness, and in service, and in being good, and, and, and loving our neighbors in every way. Now that's the love of God. That's the love of God, my friends. But the love of man is to heap your wrath, your anger; just vent your wrath on people. Because you love your own self so much and you're resentful toward them because you think they affronted you. Oh I tell you, people know so little about the love of God. Now, man has proved incapable of being righteous? God demands something absolutely impossible? God demands absolute perfection and obedience and man cannot give such obedience? Well my friends, let me tell you something. If you surrender to God, if you want to have that absolute obedience, if you are willing instead of stubborn and rebellious, like this particular listener was that wrote this letter. This was some time ago and I'm sure that particular person stopped listening long ago, because, you know the truth sort of upsets people that don't want it. And, if, if you were in the presence of a Holy and Righteous God, in all of your sins, my friends, you'd be miserable and uncomfortable. And I guess people that don't love the truth of God get rather miserable and uncomfotable when it comes pouring out. And so I am sure that that particular person has stopped listening a long time ago, because this letter came quite a while ago. Christ's faith put in him. That's the only faith that will save you. Very few people know what kind of faith it takes to save. Most people think it is your faith in Christ. Well that's something you have. That's something you contribute. Can you contribute that which will save you? Of course not! Now listen, your obedience to God's commands will not save you. YOUR FAITH IN CHRIST will not save you. But your surrender to God and willingness to obey His commandments, and your faith in Christ; those two things will cause the blood of Christ to apply in your life. You see, reconciled to God by the death of His Son, not saved by the death of His Son. It doesn't say that. But reconciled to God by the death of His Son. Now when you are reconciled to God, then God can save you and He promises to do it. But, that's what God does. And what you do is to repent and to believe in Christ. BUT WHAT YOU DO does not save you. Get that straight, my friends. YOUR OBEDIENCE WON'T SAVE YOU. YOUR SURRENDER WON'T SAVE YOU. YOUR COMMANDMENT KEEPING WON'T SAVE YOU, and your faith will not save you. But, all of those things can reconcile you to God. And when you do those things, you perform the condition and God promises to do something to put HIS SPIRIT IN YOU. And that is the spirit, the righteousness of God. That is the love of God shed abroad in your hearts. That is the love that WILL keep the commandments of God perfectly, as long as you yield, as long as you follow the spirit. And it is those that are: "...led by the Spirit of God, that are the sons of God" (Romans 8:14), and no one else is. Your Bible in seven different places in the New Testament calls all others the sons of Satan the Devil. Take your choice, my friends. That's the Word of God:- it's in you Bible. Now then as, "...we were reconciled to God by the death of his Son, much more, being reconciled [because God has promised it now] we shall be saved [how? Not by His blood, not by His death, but:] by his life." (Romans 5:10) L-I-F-E.] By His life. But you can't be saved by His life, until you have accepted His blood. Until you have been justified of past guilt. Until the great wall that you have created between you and God has been wiped out, you cannot possibly have access to God to receive salvation. But God has promised it to you when you do. Well I just wanted to straighten that up as we go along, because this person who wrote this letter didn't understand any of that. Just had an idea that her own faith would save, but her own obedience would bring her under a curse and all that sort of thing. Why that's the most ridiculous thing you ever heard of; that you can have faith while you disobey God. That you can be impudent, you can disobey God, you can go contrary to His will. Just take your own will, but if you have faith in Christ that's going to save you. Well I'm going to show you some scriptures here in just a minute, but let's finish this letter first. Now here we are next, "You are a group that prides yourself.." this woman accuses "in disbelief of all the vital plan of redemption and the very divinity of Christ." Well now that just simply is not so. Perhaps we do — we don't pride ourselves — but, we do have disbelief in some manmade ideas of a plan of redemption. Or, manmade plans of redemption, but not in God's plan. Not in that that you find in the Bible, not in what Christ preached. Not in what the apostle Paul preached. Because that we believe, and that we affirm and that we preach. And the very divinity of Christ: listen to that. Well, some of you have heard me preach a long time and you know how false that statement is. I, I just have to ask God to have mercy on this poor soul that says those things. That's what Jesus did on the cross — those that persecuted Him. He said if they have persecuted me, they will persecute you, and they do. Here it is, she says that "you are a group that prides yourself in the disbelief of all the vital plan of redemption and the very divinity of Christ and so are going straight to hell." Well that is where she has consigned us, but that isn't where God is going to consign us. I have God's promise. I can rely on that, rather than her accusation. So my friends, Jesus said that if they persecuted Him, they would persecute us if we serve Him. And I guess we, we get our fill of it. That's just one little letter. Most of them I never read on the air. It isn't only letters. We get persecution from about every hand and we get plenty of it, if that's any evidence, and it is. If you don't bring it on yourself. I tell you, I've known of people that go around deliberately trying to do things that will bring persecution on themselves; unseemly things that they are not called upon to do. For instance, like refusing to salute the flag and things like that. Now to worship the flag is another thing. I wouldn't worship the flag of the United States or any kind of flag. I'm going worship Christ and worship God Almighty in heaven. I will not permit anything else to become another GOD BEFORE HIM. But I certainly will salute the flag of the United States, because it's merely a symbol. And saluting it is merely the same thing as I would take my hat off to a lady out of respect and to just simply show respect to her; and an acknowledgement. And I want to tell you my friends, we owe a lot of respect to the United States — to this nation, this country of ours and the flag that stands for all of that. For everything, all the privileges that it has given us. I'm very thankful and very grateful. We are told in the Bible to pray for the kings and rulers. And in our case, the president of the United States, the governors of our state, the mayors of our cities. Do you do it, my friends? You should, you should. And you should be very grateful for the privileges. You know it is one thing to salute the flag, to acknowledge, to show respect. It is another thing to worship. But some people will, I guess just not understand and confuse the two and they seem to think it might be worship and so they refuse to even have any respect for the flag of the United States. And bring persecution deliberately on themselves. Well, that isn't the kind of persecution Jesus was talking about. He told us to do nothing to deserve any persecution. But we are going to get it for just following God instead of man anyway. "...all who (that) will live godly in Christ Jesus shall suffer persecution." (II Timothy 3:12) That's in your New Testament. Well, you know Jesus Christ said: "...no man has ascended up to heaven..." (John 3:13) And your Bible says that: "The righteous shall never be removed: and [but] the wicked shall not inhabit the earth." (Proverbs 10:30) Yes that's back in Proverbs:10:30, I believe. Well, this woman didn't know very much about what we do believe, or she wouldn't have made these accusations. But she said that, "We are ignorant, that we must be born again. And that Christ came to seek and to save that which was lost. And that salvation is a free gift, and not something we can gain by works." Well my friends, I want to straighten some of this out. Here's a person that is all mixed up. Now listen, you can't work your own way into heaven, or into salvation, or into any thing else that is a gift of God, I can tell you that. And we are not very ignorant about being born again, my friends. We understand what it is to born again, but not very many people do. A lot of people think that shaking the preacher's hand or being immersed in water, or knowing a password, or making a profession before men is being born again. Well it is a long ways from it. You know if your condition of heart is right, if you have repented, if you believe in Christ, those things going along with it, might be the start. They might mean that you get begotten of God by receiving His Holy Spirit, but when you're BORN of God, my friends, you won't even be mortal anymore, you'll be immortal. You won't be human — you'll be divine: believe it or not. And that's what your Bible teaches. Not very many of you have any slightest conception of what it means to be born again. Well we certainly believe in that. AND BEING BORN AGAIN IS A COMPLETE CHANGE. It's not only just a change of mind and a change of attitude, that's the start. It's a total change, even of composition, so you won't be flesh and blood any longer. Yes, and it is a free gift, but there are conditions. And you don't earn it by your works, and you don't earn by your faith, you get it as A GIFT OF GOD, but God will not give it, unless you perform certain conditions. Now we are coming to that. Yes, He was a messenger. Jesus Christ was a messenger bearing a message. He was more than a messenger. He has many offices. He is now the High Priest. He has been a messenger, He is the Word of God, the LOGOS, and also He is the Savior. You know He has lots of offices and being a messenger doesn't do away with His ability to save us, or the fact He is the High Priest now and He is coming as the KING OF KINGS to rule over all the world; and we better realize it. Well my friends, when the blind lead the blind, they all fall in the ditch. Well God help us then to get our eyes opened. God help us! Now I want you to listen to the very words of Jesus in Mark the fourth chapter and the sixth onto the ninth verses. About these people that want to believe in Christ and their, their faith in Christ — they think their own faith will save them. And they want to worship Christ, but no obedience. No they don't want to obey Him. They don't want to obey God. They don't believe in the commandments of God. They ridicule them and say that we believe God said He so loved the world, He gave His only begotten Ten Commandments. Of all the foolishness that I have ever heard, that is about the prize winning piece. And that way they worship Him in vain. "Full well you reject the commandments of God that you may keep your own tradition." (Mark 7:9) Turn to Mark the seventh chapter, sixth to ninth verses in your Bible. Lasciviousness is license to break the law of God, turning grace into license to disobey God. With the idea that you can break the law of God and that is alright. So they are: "...ungodly men, turning the grace of God into lasciviousness, and denying the only Lord God, and our Lord Jesus Christ." (Jude 1:4) That's Jude the third and fourth verses. Yes, my friends, even before the New Testament was completely written, ungodly men had crept inside the church to corrupt it. Turning grace into license; unrestrained liberty, abuse of privilege to disobey God. Well my friends, I've only started again and I want to go into this thing — what is salvation? How can you be saved? I want to tell you my friends, there is absolutely nothing that our western world of Christendom is more mixed up on than that one thing. Get our booklet on 'Water Baptism.' and also write in for the booklet on 'What kind of FAITH is required for Salvation?' Get that booklet — it is going to open your eyes. Many think they are converted and saved and they are not at all. They have been misguided and misled. Sincere people, honest people, they have just been deceived. They don't know the way. They've been mixed up. Now it isn't going to cost you anything and it isn't going to hurt to find out. So until tomorrow then, good-bye friends.